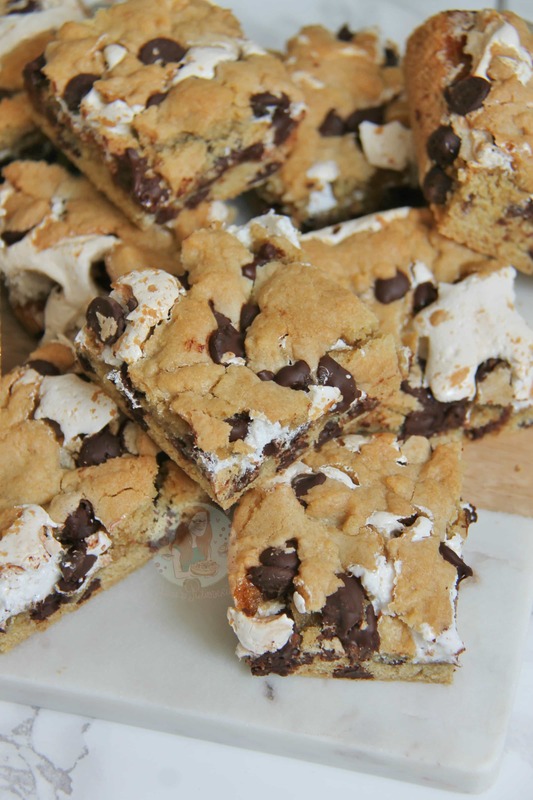 Gooey Chocolate Chip Cookie, Gooey Vanilla Marshmallow, make THE most Delicious S’mores Cookie bars ever! Ohhh so like.. yeah. Cookie Bars happened again! I honestly couldn’t resist. I’ve actually baked these beauties several times, getting them slightly more perfect each time. I tried these in quite a few different ways, and honestly, this one stuck. 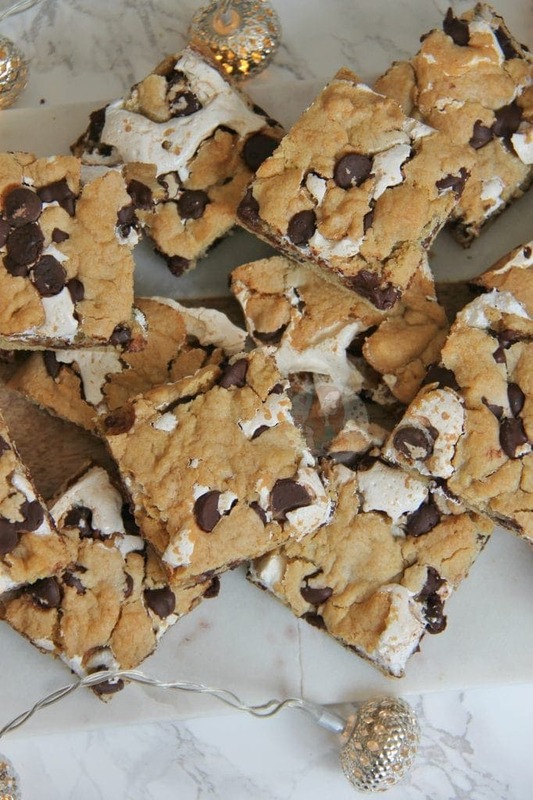 How could you not love Marshmallow and Cookies together?! If you like S’mores then you will love these. Honestly… biscuit, marshmallow, and chocolate together is heaven. 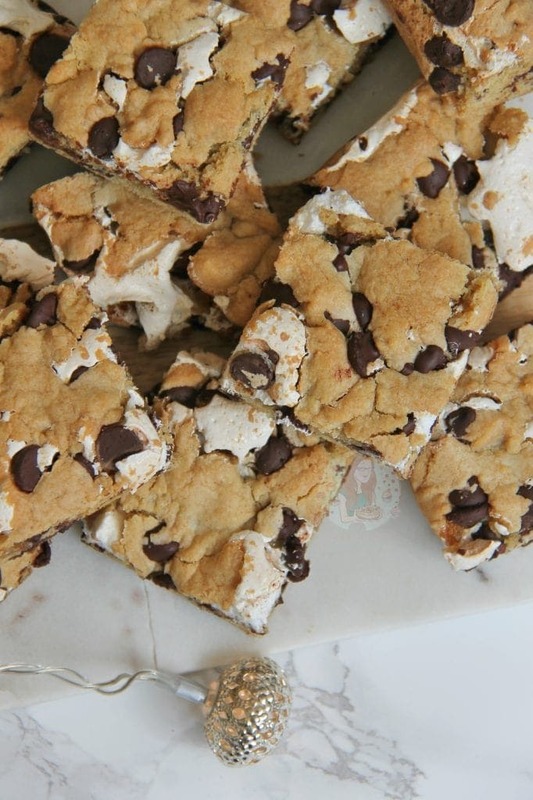 So imagine a gooey, chocolatey cookie together with gooey marshmallow. MY IDEA OF HEAVEN. These would suit being more towards Halloween and Bonfire night, but I just couldn’t resist posting them now. I recently made my No-Bake S’mores Cheesecake again, along with my S’mores Cake for a party and everyone said how good a cookie version would be… so I knew I should finally post this recipe! I went for my usual cookie bar style recipe, as I have also used in my Mini Egg Cookie Bars and Rolo Cookie Bars. 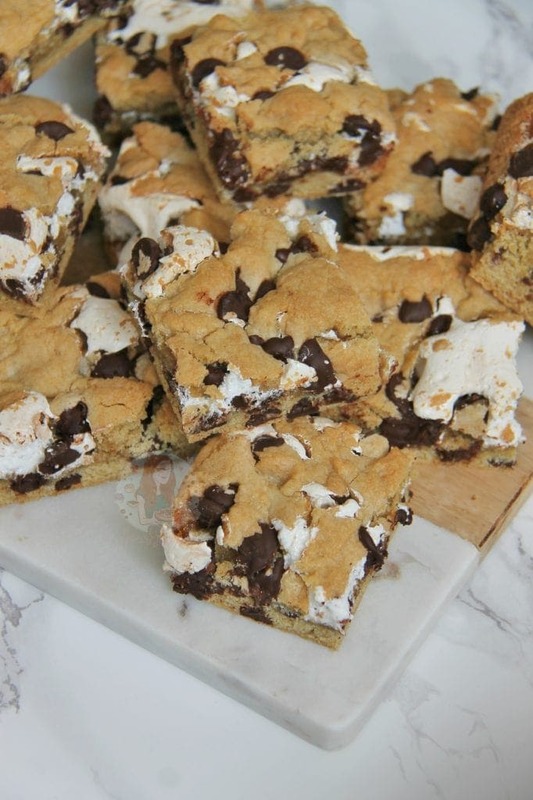 The baking time is somewhere in the middle of these two recipes however… It’s hard to explain sometimes, but the Marshmallow Fluff makes the cookies gooier, and stops them drying out like the Rolo Cookie Bars do. The Mini Egg Cookie Bars can often dry out a lot more as there isn’t anything in there to keep them very gooey, so the Marshmallow Fluff is a dream. I love anything S’mores as I have said, but these are just DELIGHTFUL. You need to split the cookie dough into two sections… two thirds and one third. It can be a little bit faffy, but you need to press down the first lot of cookie dough so its even (often easier to use your hands) and then spread the marshmallow fluff on top. The problem is, marshmallow fluff is so sticky, its easier to microwave it for 20 seconds so its spreadable! Then comes the problem of putting the next third of cookie dough on. I rolled mine out onto some clingfilm, so that I could turn the layer onto the marshmallow fluff evenly! It’s awkward, but SO WORTH IT. If in doubt, blob bits of cookie dough all over the marshmallow fluff. Add in the Dry Ingredients, and mix till a cookie dough is formed. Add in the Chocolate Chips and mix with a spatula until they’re spread through the cookie dough evenly. Press two thirds of the the mixture into the bottom of the tin. Microwave the marshmallow fluff for 20-30 seconds and spread over the cookie dough. Spread/cover the marshmallow fluff layer in the other third of the cookie dough. It might be hard to spread it, so I rolled it out onto some cling film, and then turned it onto the marshmallow layer to make it even. Bake the traybake in the oven for 20-25 minutes, until the top of the cookie bake looks ‘dry’! 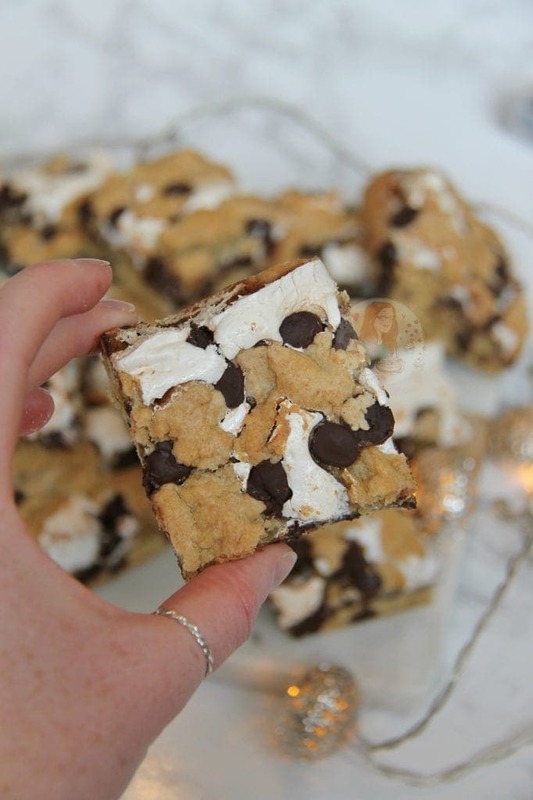 If you try to use actual marshmallows, they will boil and basically disappear into the cookie bars. Marshmallow fluff is usually found in the supermarkets near the Nutellas and Jams etc, and its quite commonly available! These delicious beings will last in an airtight container for up to 4 days, but honestly, they’ll be eaten before then. You can use whatever chocolate you want in the middle – but I used Dark Chocolate Chips. Milk or White work well, or even a flavoured chocolate! This post was not inspired by anyone in particular – but I took inspiration from photos on Pinterest/Instagram and just has a go at it! 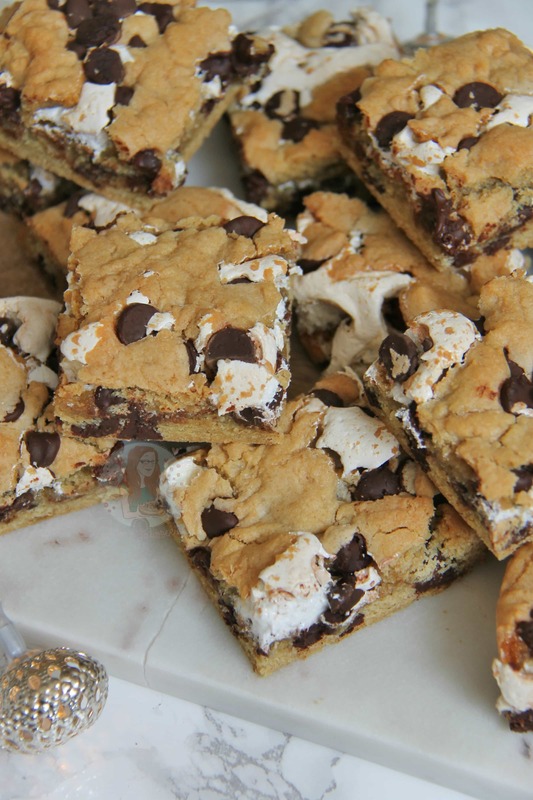 Find my other Cookie and Cookie Bar Recipes on my Recipes Page! Older Next post: Mini Chocolate Cakes! Can I make these and freeze them?? I’ve never frozen these particular ones, but I believe you can! Most cookies you can, the only bit I was unsure of was the marshmallow fluff factor! These look delicious! Have just ordered some Marshmallow Fluff and am going to make them next week! 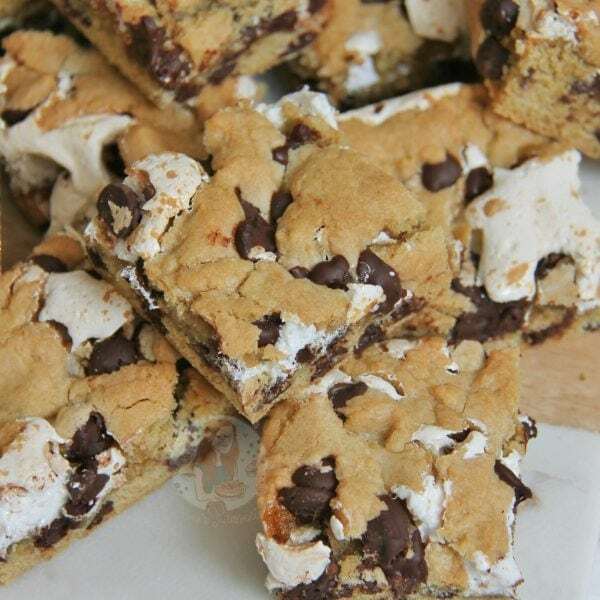 The layer of cookie dough on top is quite thin, and the marshmallow naturally breaks through in weaker areas. It doesn’t need to be perfect. Hi there – I’ve not been able to source Marshmallow fluff too easily – has anyone tried this simply with marshmallows in their place? Whereabouts are you from? As noted in the tips and ideas section on the post, actual marshmallows will just dissolve and cause the traybake to not bake so well. These look amazing Jane! I’m excited to try the recipe for myself!